D. Maytham Laibi *: Is there a substitute for currency auction! Bond Ladys Corner » NEWS FROM IRAQ » Iraq Dinar & CBI News » D. Maytham Laibi *: Is there a substitute for currency auction! Is there a substitute for currency auction! Once a new stand of monetary policy on the brink of a pit, after that was the direction contractionary in order to tackle inflation, which has succeeded in reducing it from 53% in 2006, to nearly 3% in 2009, turned to keep pace with the goal of economic growth and tackle unemployment, through the use of direct and indirect tools, editor of greater interest rates, and an expanded bank liquidity range, to keep the stability of prices in each of those stages basic objective, through currency auction, which is managed by the achievement of a difficult equation represented by providing price stability and the provision of Iraqi dinars to the government, and dollars to the private sector in order to satisfy its imports. Now the question: Is it time to witness another shift in monetary policy, and change paths auction currency, especially, by identifying, for example, sales volumes, or reduce the value of the Iraqi dinar against the dollar, or delivery of this file to the other? So out of a basic assumption to say that the central bank should not be responsible for trade policy and imports by the private sector alone, and return to the traditional role of which maintain the stability of domestic prices, including the exchange rate. Currently, it seems that everyone avoids taking such a step, or that no one wants to take a bold steps. The more decisions that can go forth views are centrist solutions, and that under conditions of uncertainty in which we live these days, and the fear of getting involved in decisions that could be dire consequences. This is usually the case when the economic conditions are going to bankruptcy, for example. The answer requires a tee from another question: Is it depends on the price of oil down, or that this decision must be taken even if prices have improved, and returned to the revenue increase ..? This may seem to impose a comfortable, if achieved in the second Shatrah, or even if that someone told us with certainty, that oil will rise on sticks! In all cases, we see that the discussion can be released from the low prices could lead to serious thought to reconsider the currency auction, and enter into a new phase, even if oil prices rose again, and access to an important conviction stems from that oil revenues could be a function is not necessarily linked to the requirements of public spending, and keep instead to a basket of reserves represents a stabilization fund, and dispose of them; then, outside of government spending and requirements of the circle, which are political, security and socio-Daulah than economic efficient. All of this stems from the say that the current oil shock should not pass without the benefit of studied. Certainly, we will not discuss the pros achieved by the auction over the past years and there are many without a doubt, but the key question is: What flaws in the auction currency basis, and the defects that she began to devote After declining oil prices, especially..? 1. As we enter the budget in 2015, and the decline in oil prices has become the currency auction is a big burden on the central bank itself, especially as we enter the new dollar wave Aziz, and begin to phase separation between the exchange rate determined under the auction and the price of the parallel cashed in the market, down to the multiple exchange rates later. 2. The emergence of suspicions of corruption between now and then, and extreme caution by the staff of the central bank managers to get involved again in the problems of the type in which the involvement of D.sinan Shabibi D.mzar Mohammed Saleh, a large team of judicial some unresolved issues until this moment, what is causing the case of frequency by the staff to take any steps to work soft auction. 3. doubts about the procuring entities of the dollar and that intervention in the currency auction, and replaced more than once, and not to be trusted third-party banking and Asirfah can rely on them to distribute dollars to meet the real requirements of imports, and they do not exceed the other ends. 4. doubt in the ability of government to meet the provision of the dollar in the same previous quantities, which is independence, which the central bank enjoys relatively. Especially Article 50 of the 2015 budget law, which set the amount of the auction sales to $75 million a day. 5. auction, what falls under different labels could not find a clear mechanism to separate the real needs of the market, and the requirements of dollars, and what goes of those dollars out of Iraq, without exchange for goods imported from the (smuggling or escape or money laundering). Nor did Tgibna regulators and statistical many questions, such as: Is there really a gap between sales and offset of dollars of imports, and Mghader this gap, and the volumes of money laundering operations that occurred. And so, taking into account that the central bank operates according to law, which allowed the provision of the dollar and the freedom of trade and conversion. 6. did not discuss currency auction, serious and in-depth, the potential to change the dinar's exchange rate against the dollar, the currency through the auction, and the possibilities of the cases raise the value of the dinar or reduced. I think that the time has come to open an in-depth conversations about reconsider auction currency, the dialogues open wider horizons, regarding the visions of the state on how management of the economy and the distribution of wealth, and alleviate dependence on rents and petrodollars, and the overall business, financial and monetary policies, and the leading question about the feasibility of continuing to the goal of social justice, without regard to the requirements of efficiency push forward, or find a balance between them in the least, especially given that the last stage, which was marked by financial abundance, has deepened the poor distribution of wealth and wasted considerations of efficiency at the same time. 1. lead to a reduction of the budget deficit gradually, and covers the case of low liquidity dangerous experienced. 2. could ease the volume of imports, especially that the Iraqi market is a net importer of various commodities, and the worst origins. 3. 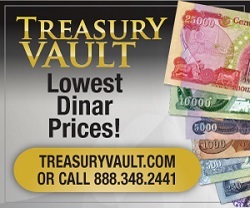 The low exchange rate of the dinar, is likely to contribute to an increase in some of the domestic production, and then activates the private sector, and contributes to the increase of employment, especially if accompanied by a consistent fiscal policy and pour in the same goal. 4. can represent the reduction of the dinar exchange rate policy, and lead him from the rises in prices of various commodities, a substitute for taxes, which are difficult to talk about it now and apply, while the rise in commodity prices will be a substitute for indirect taxes, both of which can produce the same impact on the reduction of entry, leading to lower demand and consumption.